Puttanesca is a simple and delicious sauce that uses pantry staples to get a crowd pleasing dinner on the table fast! This post is sponsored by Cans Get You Cooking. All content and opinions belong to Mama Loves Food. 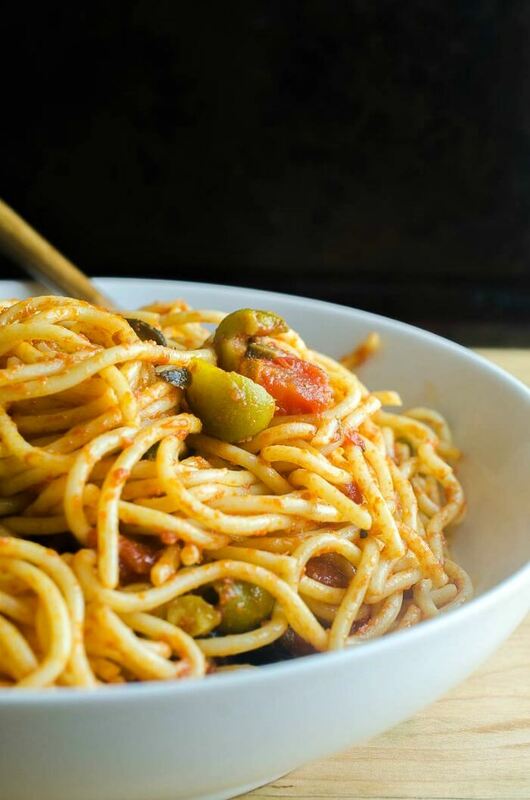 Puttanesca is full of flavor from the canned olives and tomatoes and brings your pasta dish to a new level. It’s full of umami (that savoriness that makes food satisfying), saltiness, and colors, and is one of my favorite go-to dinner ideas. Other than garlic, all the ingredients are in my pantry – or my “Cantry!” (and let’s be honest, I may have some pre-minced garlic on hand). 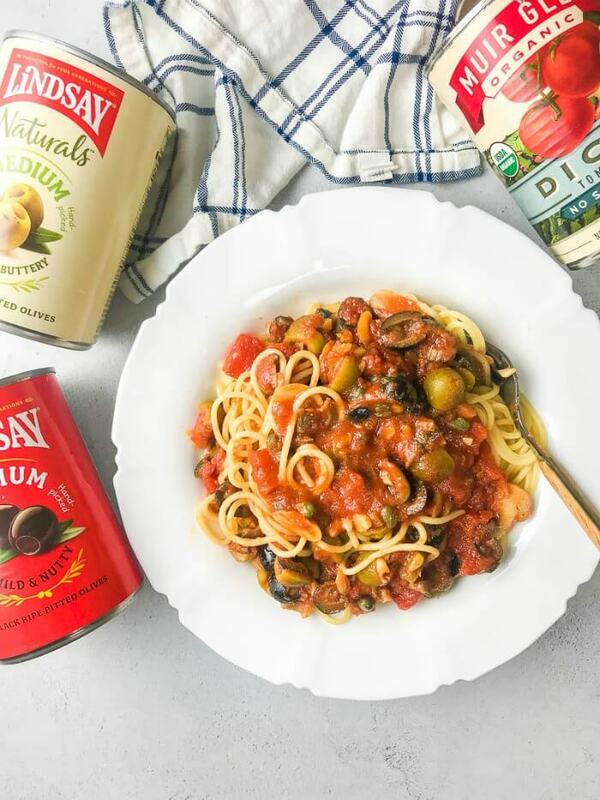 We love using canned vegetables in our Pasta Puttanesca If you make this recipe tag it with #cansgetyoucooking, then visit the Cans Get You Cooking site for even more inspiration! Olive Oil – Use a good extra virgin olive oil if you can. Canned Anchovy Filets – I love keeping these flavorful little guys on-hand. Capers – Don’t leave these out! They are actually flower buds that have been brined, and their salty goodness is key to puttanesca. 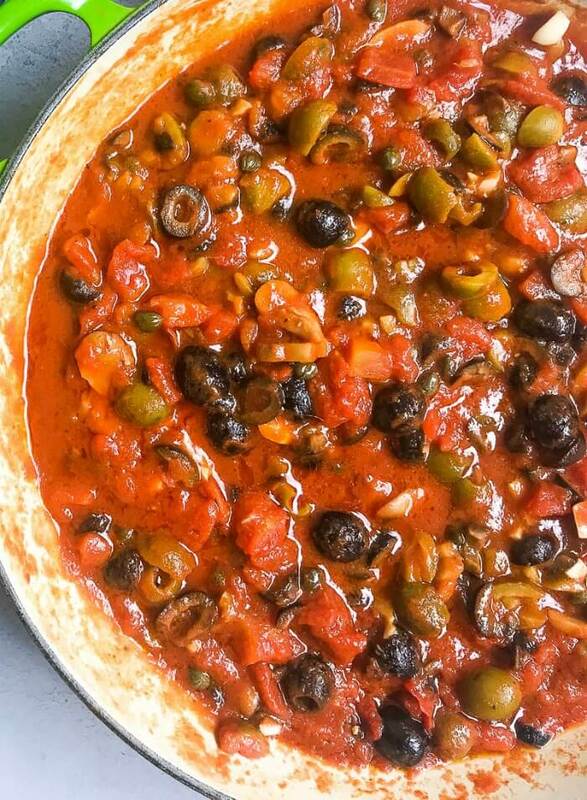 Black Olives – The black olives add depth of flavor to the sauce. 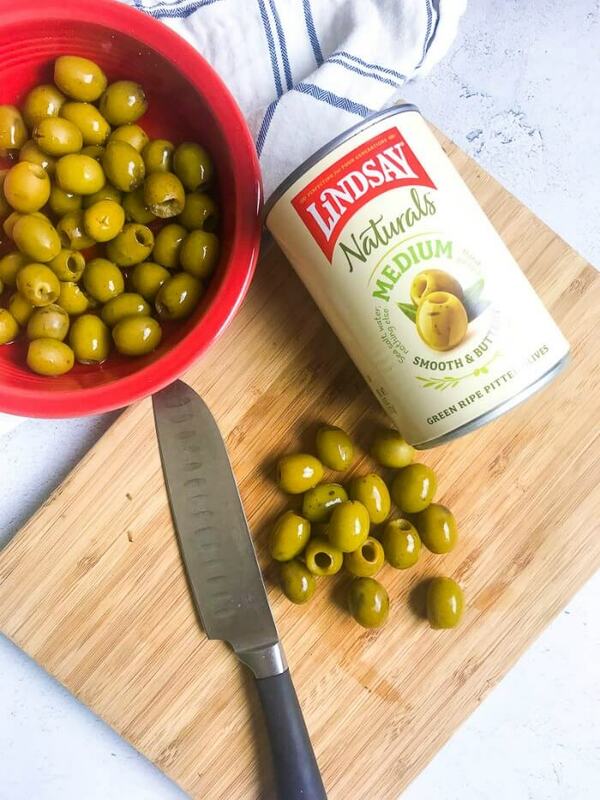 We used Lindsay brand canned olives. Green Olives – These add saltiness and color. 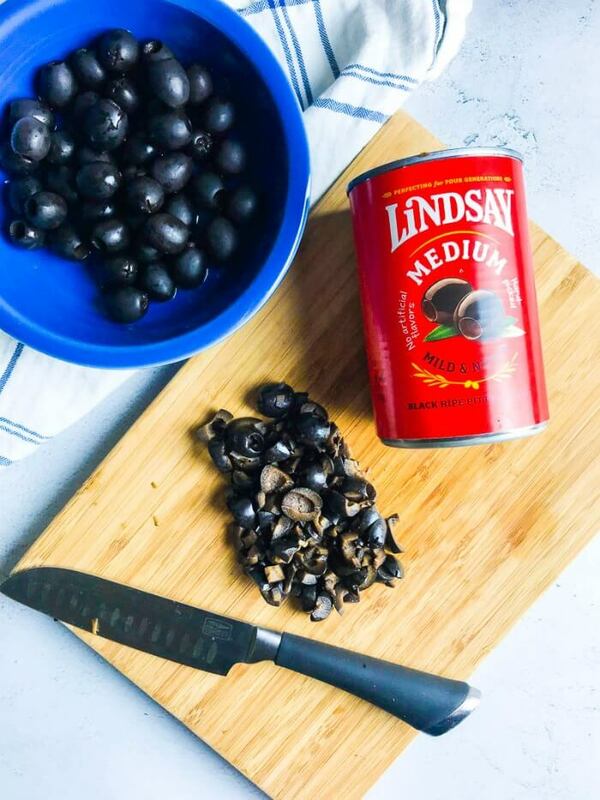 We used Lindsay brand canned olives. Garlic – Mince or press 10 minutes before using (while you’re opening up cans) to release extra nutrition. 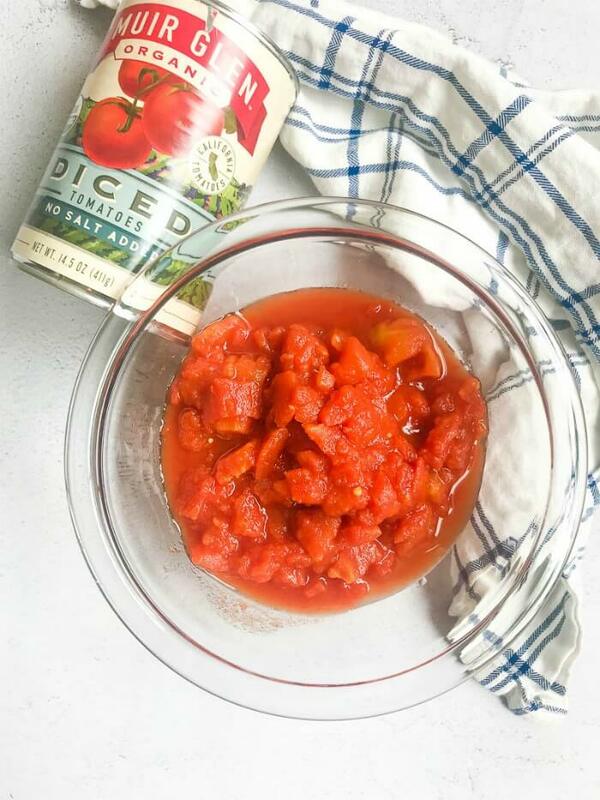 Diced Tomatoes – Make sure you don’t drain them, and look for the no salt added variety. We used Muir Glen brand canned tomatoes. Canned Tomato Sauce – Pick one without extra flavors, as this will be the base of your sauce. Also, try get one with no salt added as the olives and anchovies are heavily salted. We used Del Monte brand tomato sauce. Canned Mushrooms – Canned are ideal. I mean, how many times have you bought mushrooms, only to watch them spoil? Canned foods can help Americans reduce the amount of perishable fruits and vegetables purchased and then thrown away! We used Green Giant brand canned mushrooms. Salt & Pepper – “To taste” is important here! The sauce has lots of salt elements so taste before adding any extra! 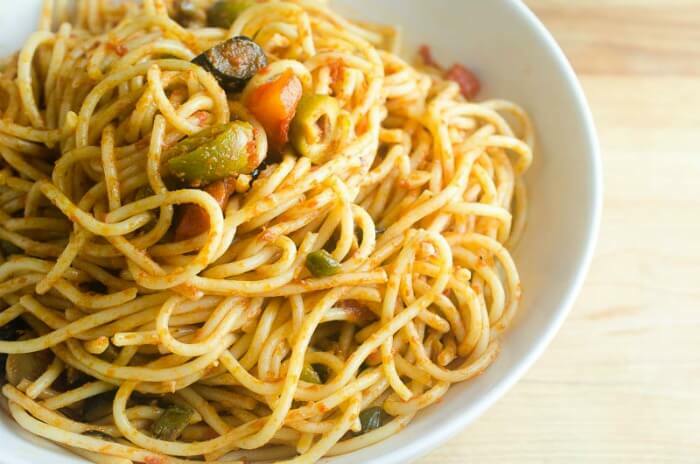 Spaghetti – Traditionally, regular spaghetti is used, but feel free to use your favorite. First, heat oil in a skillet over medium/low heat. Add garlic and saute until fragrant. Next, add tomatoes and tomato sauce, saute an additional 3 – 5 minutes. Then, add remaining ingredients (except spaghetti), simmer on low an additional 5 – 10 minutes. We love using canned vegetables for our puttanesca recipe. Not only is it a delicious meal that my kids love and one that I can make it right out of the pantry, but it also helps me to cut down on the amount of perishable food that I purchase and then spoils before I actually get a chance to use you. PLUS, keeping my pantry stocked with canned fruits and vegetables helps me to serve up the recommended 42 cups of fruit and 53 cups of vegetables a family of four needs every week. You can keep Puttanesca in the refrigerator for 3 – 4 days. Store your Puttanesca in an air tight container for best results. Yes, you can freeze puttanesca sauce (without the spaghetti) for several months. Place it in an airtight container, allow to cool, then label and freeze. Leftover Puttanesca can be used as a topping for many things other than pasta. Here are some of my favorites! Puttanesca does not taste fishy. Adding anchovies to a dish adds salt and umami, but not fishy flavor. If you’ve ever had a Caesar Salad at a fancy restaurant, I’ll bet you didn’t think it tasted fishy, but anchovies are a key ingredient in that dressing. 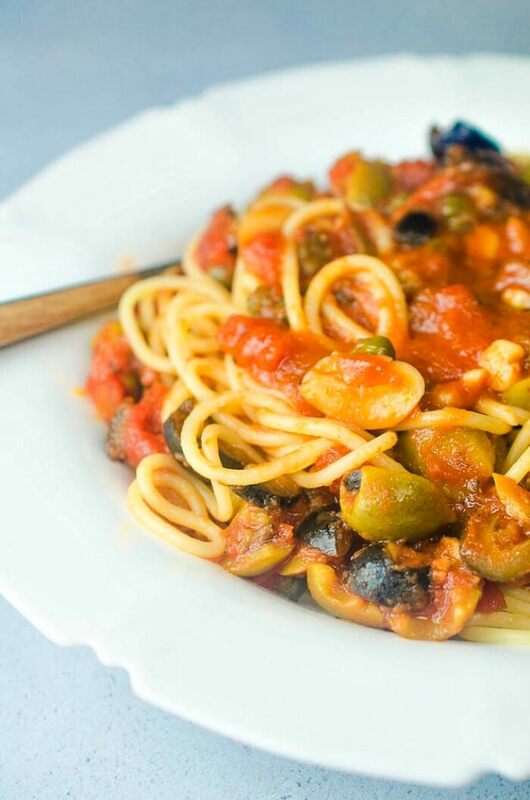 Puttanesca sauce is healthy for most diets, as it is full of vegetables and healthy oils. 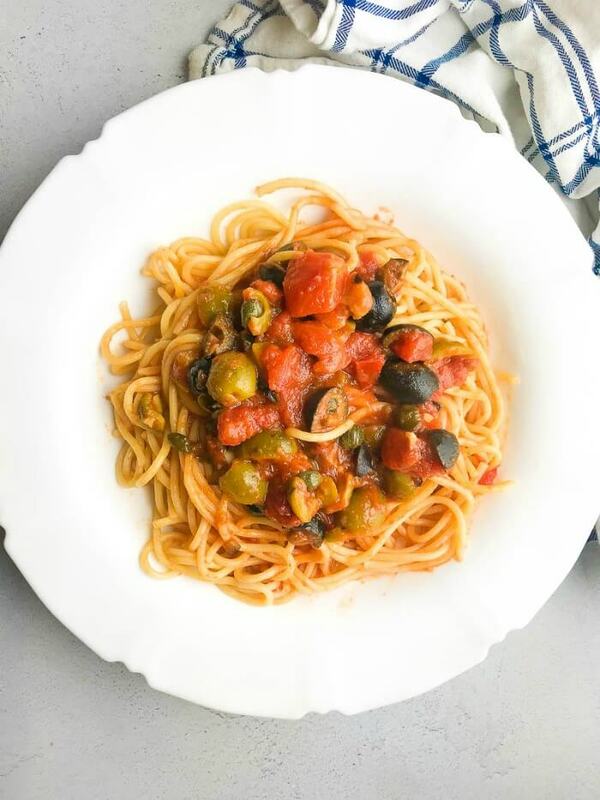 Anchovies are a good source of Omega 3 fats (which are anti-inflammatory), olives and olive oil are a good source of mono-unsaturated fats (heart healthy), and the tomato products are an excellent source of lycopene (an antioxidant). If you have the puttanesca sauce over meat, fish, or eggs, it is paleo and keto friendly. 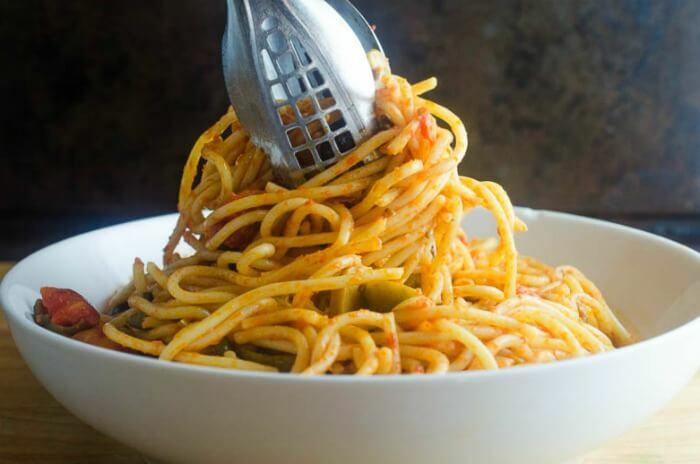 Puttanesca is traditionally served over spaghetti but here are some more ideas of what to serve it over and what to serve with it! Puttanesca is a bright and lively Italian dish. Here are some more similar recipes we think you’ll love. Everyday pan – This is a 12″ two handled pan that you will use pretty much every day. Which, of course is why it’s called an everyday pan. I use a whole lot of pots and pans in my line of work (apologies to my husband, the dishwasher!) and these are by far my most frequently used pans. If you make this recipe tag it with #cansgetyoucooking, then visit the Cans Get You Cooking site for even more inspiration! 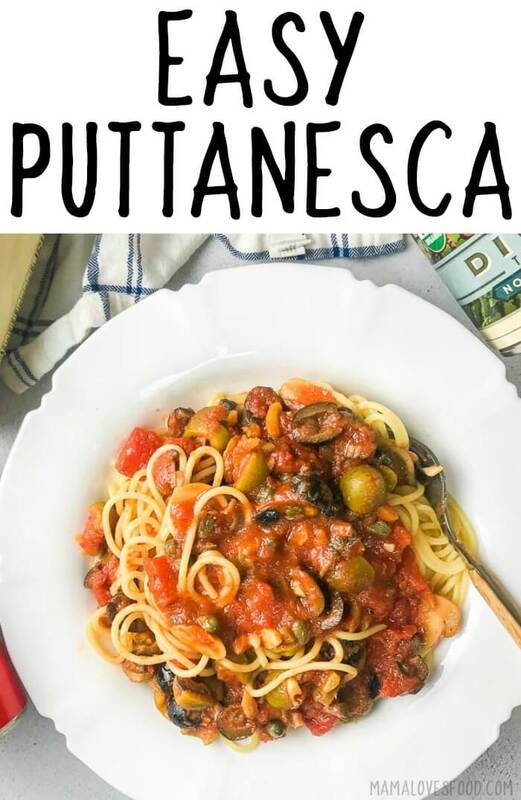 Puttanesca is a quick and easy sauce that uses pantry staples to get a delicious dinner on the table fast! Heat oil in a skillet over med/low heat. Add garlic and saute until fragrant. Add tomatoes and tomato sauce, saute an additional 3 - 5 minutes. Add remaining ingredients (except spaghetti), simmer low an additional 5 - 10 minutes. To learn more about the benefits of cooking with canned food, visit CansGetYouCooking.com, and check out this cool stop motion video! This looks wonderful , I know I have made this before at work for seniors they loved it, but your recipes has more ingredients I will make it for myself ,I love pasta of any shape. My husband adores this. Came out exactly as pictured!